Place the ignition switch in the ACC or ON position, then press the VOL (volume) control knob / power button. If you listen to the radio with the engine not running, place the ignition in the ACC position. The mode (radio or CD) that was playing immediately before the system was turned off resumes playing. When no CD is loaded, the radio comes on. Pressing the VOL (volume) control knob / power button again turns the system off. Turn the VOL (volume) control knob / power button to the right to increase volume or to the left to decrease volume. Bass → Treble → Balance → Fade → Spd. Sen.
to the desired level (-5 to +5). Balance adjusts the sound between the right and left speakers. Fade adjusts the sound between the front and rear speakers. Once you have adjusted the sound quality to the desired level, press the MENU button repeatedly until the radio or CD display reappears. Otherwise, the radio or CD display will automatically reappear after about 10 seconds. If the text information is too long to fully be displayed on the screen; press and hold the DISP button for longer than 1.5 seconds to scroll through the rest of the text. 1. Press the MENU button repeatedly until “Adjust Clock” appears on the display. 3. “Change Hour” will appear on the screen. Turn the TUNE/FOLDER knob to adjust the hours and then press ENTER. 4. “Change Minute” will appear on the screen. 1. Choose the radio band AM, FM1 or FM2 using the AM or FM button. to skip several tracks. Each time the button is pressed, the CD advances one additional track. 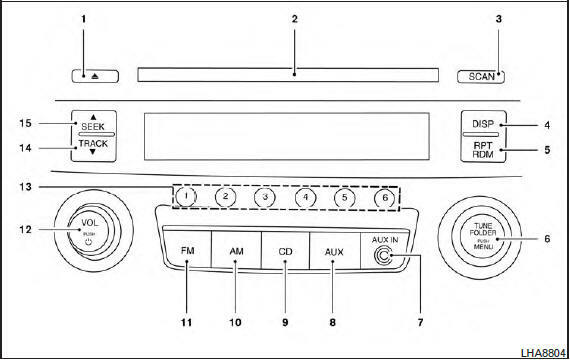 For more information about the Bluetooth® audio interface available with this system, see “Bluetooth® streaming audio without Navigation System (Type A)” in this section.